New technologies and fresh perspectives are shaping the planning landscape. This month's cover story, "Smart Cities or Surveillance Cities?" investigates the impact of privacy concerns raised by smart-city technologies. Planning also considers the longevity of scooter-sharing programs and suggests new strategies to revitalize public meetings. Toronto’s experiment with Sidewalk Labs is exposing some cracks in the urban tech utopia. Story by Brian Barth. Jake Blumgart looks to San Francisco’s scooter pilot program for a hint at what’s down the road for this trend. Housing Action Plans can make the difference in communities with pressing affordability issues, Kristen Pope reports. Spotlights on plans in Santa Rosa, Big Sky, and Philadelphia. Jeffrey Spivak rounds up the strategies bringing some life — and diversity — to the public meeting. A guest column by APA Foundation President Mary Kay Peck, FAICP. Social Equity Task Force, interest groups, APA’s career center. What does your community need to ensure its ability to adapt to climate change? Ending single-family zoning, LEED-STAR merger, reducing vehicle emissions. Subdivision regulations find a renewed use in resiliency planning. Reid Ewing considers the shortlist for JAPA’s Best Article of 2018. Markets, U.S. transit, social ecology. App roundup, mobility exhibit, Ai Weiwei documentary. 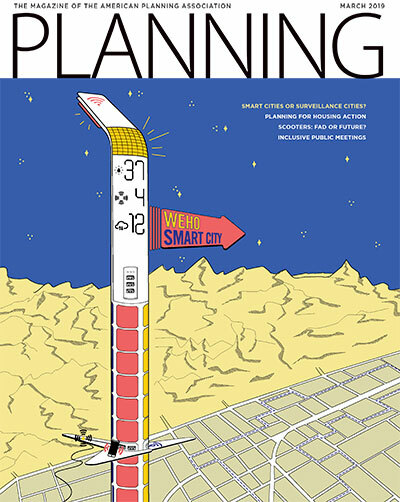 Cover: Illustration by SOM with CityFi for the City of West Hollywood.